We set the traps out at 5 a.m. this morning and by 4:00 in the afternoon, they were brimming with blue crabs. We will feast tonight! The Blue Crab Dip Set includes (1) 12.5" Charger & (1) 3-Cup Salad Bowl presented in a pretty 13.5" x 13.5" x 4" gift box. 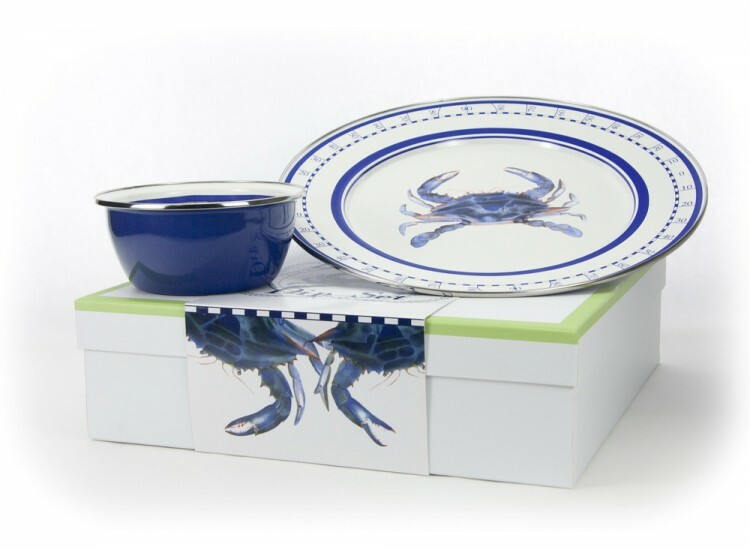 This Blue Crab Collection is made of porcelain enamel fused on carbon steel. These are great for the outdoor shrimp and crab boil! They are durable and can be used in the oven, on the stove top, under the broiler and on the grill. The steel content makes them unsuitable for microwave use. This enamelware is also dishwasher and freezer safe, food safe, and passes all FDA requirements. Wait for enamelware to cool before placing in cold temperatures, and do not soak in water.